Mañosa Panciteria: Worth the Wait? I’ve heard good things about Mañosa Panciteria from punkednoodle, so when my mom started raving about it too, I knew I should investigate. My mom and I decided to lunch there so I could try their Crispy Hito (P100) (Catfish); since it was nearer her office (it’s a 15-minute walk from mine), she ordered for us as soon as she arrived. The place was packed to brimming, all the tables where occupied with large groups of people. I figured it was the lunch rush, but my mom told me that the crowd was bigger than usual. Large tumblers of Black Gulaman was served as soon as I took my seat. Cold and just lightly sweetened with slivers of glass jelly slithering down your throat, it was very welcome after that 15-minute walk. It was a sign of good things to come so I was readily awaiting the feast that would follow. Fifteen minutes passed, then thirty. I was getting fidgety. But it was a big crowd and while I could see them steadily bringing food out of the kitchen, it was always for this one big group which seemed to never have enough food! When we asked about our food, the server apologized because the crowd was larger than usual and said he’ll look into it. He then came back to our table to reassure us that the food will follow soon, then served us bowls of Maki, on the house. I gave it a suspicious glance. It looked thick and syrupy and utterly sweet. My mom reassured me that it was good so I took a sip. Surprisingly, it wasn’t how I expected it to taste. 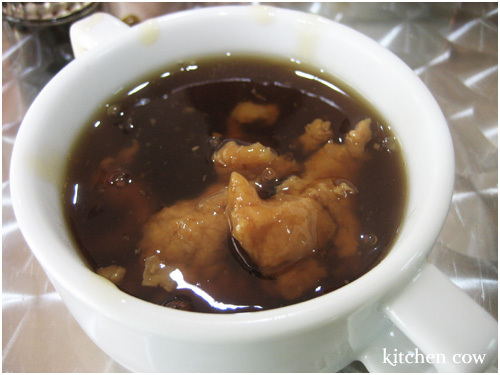 It was more meaty and full-flavored than sweet, and it was surprisingly light despite the thick, thick soup. The pork was tender and easily gave to the bite. Hearty it was, but never too heavy. Our food followed minutes later; large platters containing a whole fish, a cup of rice, a couple slices of tomato, and a sauce dish containing sliced siling labuyo (spicy chilis) and calamansi (Philippine Lemon). I promptly filled my sauce dish with soy sauce then held my breath. Judgment time! Was it worth the wait? My first bite was a mix of crisp brown fish flesh with tender, moist insides. One bite and you knew that the fish was very fresh, with just a slight sweetness that comes from fresh fish naturally. It was the kind of fish that you could eat whole—no exaggeration, fish and some bones included, simply because everything was crisp and crunchy. The rest of the meal went by in a blur. A nagging thought at the back of my head was the need to get back to the office. Still, I don’t regret trooping to Panciteria Mañosa for lunch. It was surely well worth the wait. And I’m looking forward to coming back, I would like to find out if the Pinaputok na Pla-pla (Exploded Tilapia) is just as nice. Carpark 1 Dela Rosa St.
25 Responses to Mañosa Panciteria: Worth the Wait? Hmmm…almost across Prince Plaza. It’s under the exit parking ramp of Dela Rosa’s parking, along the row with has Tsoko-Nut, Bo’s Coffee and Teriyaki Boy. It’s a pretty laid back place, carinderia-like in ambiance but the food is really good. Wow, I’ve been meaning to try this when I was still working in Makati. ^_^ Tapos meron din pala sa Valencia!!! Yehey!! Oh my, the one in QC is practically down the street from me! I have to find it! And the Makati one isn’t too out of the way either. Fried hito, love it! That good? Man, I have to juggle my sched for next week then and try to slip in a lunchtime visit to Manosa. Lucky you! I wish the Makati branch was nearer my office so I can stop by for lunch whenever I want to, but 30-minutes (to think I walk really fast!) back on forth on my lunch break eats up too much of my time. 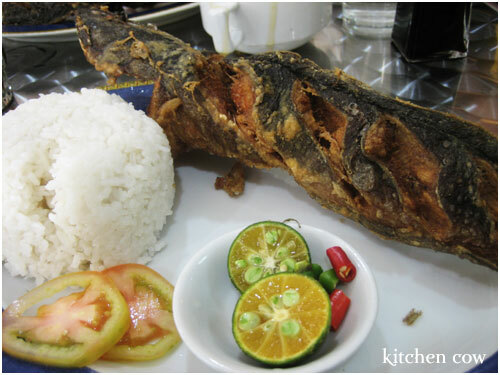 Masarap din sawsawan ng crispy fried hito ang bagoong isda ( bagoong balayan to some) with sili & kalamansi with lots of hot rice! Yummy! Btw~ I hope you don’t mind me linking your blog to mine…I like your blog a lot and would like to share it with others! I haven't tried Vietnamese-style blackened catfish but that sounds divine. There's something about contrasting textures that's really unforgettable. And about linking, please do! I appreciate the link. I'd reciprocate but my link list is set to be revamped so I'm not adding any new links right now. If it's all right with you, I'll add back when I do. the maki looks good, esp the way u describe it..
just got to read this now. i’ve been a maÃ±osa patron since i was a kid (and stupid me only goes to binondo for it to this day). didn’t know there was a makati branch. the maki’s my usual take-home. sometimes the huge siomais, too. I hope you get to try it, it’s a very unique and interesting dish. My dad and I usually troop to the original Manosa in Ongpin for our comfort food fix. Haven’t tried their fish dishes yet but just love the Maki and Lomi. we had lunch here and twas my first time! i like their black gulaman and miki bihon. I AM A REGULAR AT THE ONGPIN MAIN RESTO. THE MAKI IS THE BEST I HAVE HAD. AND YOU ALSO WANT TO TRY THE CHAMI, THE BEST I HAVE HAD ALSO, WITH SEARED FRESH PORK LIVER. Oooh, I haven’t tried their Miki Bihon. Mebbe worth a shot. I haven’t been to their main resto, I hear it’s quite an establishment. i’ve been dreaming about manosa!! when i was small my dad would drive all the way to ongpin just to get their maki and chalomi for our midnight snack… i’m so happy to find out there is a branch near my workplace. now i can go there, eat & reminisce …. thanks to this site! You’re welcome Jenova! Glad you’re getting a chance to touch reconnect with your childhood. That must’ve been a very heartwarming way to bond. I am now 54 years old, living in California for the last 22 years. Memories of the old Panciteria Manosa still haunt me all this time. I especially miss their maki. I hope to go home soon and travel back to my childhood….gastronomically speaking. IM FLATTERED OF YOUR COMMENT. THANKS FOR THAT. WHEN YOU ARE BACK IN MANILA, PLEASE EMAIL ME, AND SURELY, YOU ARE INVITED TO OUR NEW BRANCH IN SERENITY HEIGHTS BLDG. 815 BANAWE ST., NEAR STA. CATALINA ST., QUEZON CITY. YOU CAN HAVE MAKI ALL YOU CAN, ON THE HOUSE. Lovely offer, Shirlan. Will be sure to forward your message to SamC. My mother also fondly tells us about her childhood memories of going to Manosa Ongpin with our late Ah-Pa (a migrant from mainland China himself). She just turned 50 last November 30, and everytime we’re in Quiapo (particularly at Paterno St.), she would giddily ask us, “Gusto nyo bang mag-Manosa?” Long walk, but definitely worth it. We absolutely love their maki and chami (meaning their chami must be THAT delicious, as I’m the type who’d choose plain congee over pancit). It’s good institutions like Manosa still thrive, no? I like how food enjoyed by our parents and grandparents are still there for us to enjoy. And won’t it be even nicer if our children and grandchildren can continue enjoying them?